Liz & Patrick's Travels | We don’t know where we are going and this is the only way to remember where we have been! 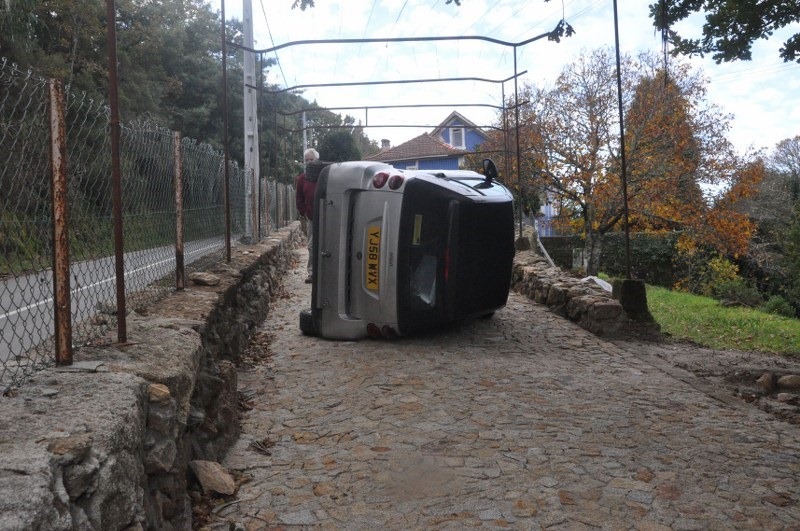 This was the result of parking on a slope with a handbrake that didn’t hold! Fortunately, there was a quarter of an hour between us vacating the car and the start of the descent. So no injuries at all. Everybody knows that construction has been the backbone of the Spanish economy for quite a few years. That is to be expected in a country that has a decent climate; is close to most of the centers of over-population in Europe and, above all, has plenty of land to build on. He is an engineer, he tells me. I am quite glad he isn’t an architect! Notice the blue curvy bits? They are plastic water pipes painted apparently badly, but consistently with blue paint. Actually, I suspect that the effect is exactly what he intended. You may be able to make out the lower rails of the balcony – twisted 1/2″ overflow pipe! The walls are pantiles, as are the window and door frames and the chimney pot. This guest annexe is around the corner but joined to the main house by the swinging walkway. And, as if all this were not strange enough, I have checked and double-checked the Lat-Long for this place and it is definitely 40.30157N 5.822406W but it just doesn’t show at all on Google Earth. Is this the worlds first “stealth” house? Here he comes, flying in from 2 o’clock high but looking more like a lobster than the Bumble Bee that has smelt the honey first. Nevertheless, this guy has some aiming skills when you think that nothing short of a bullseye will get the nectar. Frankly, the back end is a disgrace to its Mother. She should have told him how to use a hairbrush. But you have to hand it to him/her for technique. No wasted effort landing on wobbly petals. But what is he/r? Please, someone, please. This was a journey that went happily wrong because the Spanish have such a liking for switching the road numbers around. 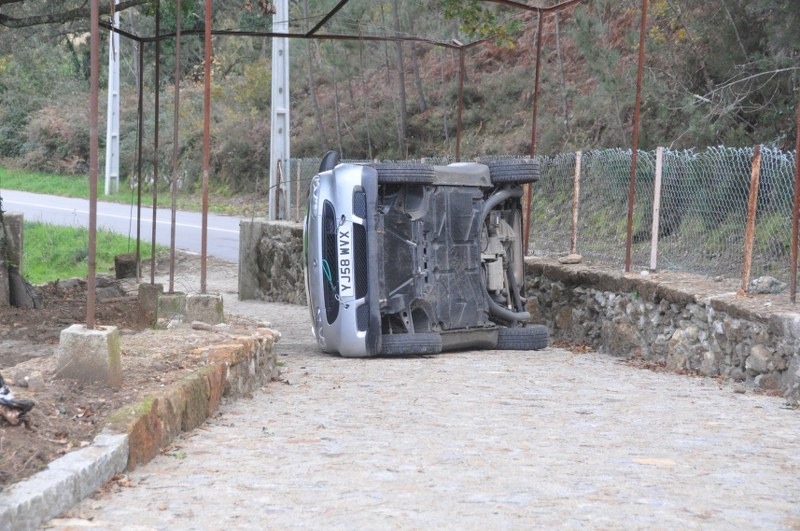 We intended to travel via the N630 to Bejar where we would go up into the mountains to see La Alberca in the Smart car. This would be a 50 mile trip down a boring flat autovia. We got it wrong and did a 90 mile trip on what may or may not have been the N620. This took us into the Gata Mountains with the full rig. In the event, the journey was not as bad as expected and we arrived at La Alberca to find a whole new carpark complete with motorhome service point and spaces reserved just for motorhomes. The spaces even accommodated our 12 meter length! The town is well known to Spanish tourists and can, apparently, get overwhelmed at week ends. We arrived on Tuesday morning and found the town active but not very busy at all. Its claim to fame is the architecture. Ground floors built from local sandstone with the upper floors in wood and wattle with generous overhanging balconies. The one above is now the town hall but was a private house and is typical of the town. This became the town hall after King Alfonso 13th visited the region in 1922 and discovered that the people were so poor that the only milk to be found for his coffee was human! He caused cows to be introduced to the area and they are much in evidence today. Despite this kick start into dairy, the locals took pigs to heart in a big way and we were sad to have missed, by just 4 days, a very important pig race. is reflected in the surrounding countryside. It does surprise to find that guns and catapults are on sale in every gift shop. You just know there are stills up in the hills and that the VAT man has a hard time of it. At over 1100 metres altitude, you need to be fit to operate here even without the racing pigs and another local brew – green cannabis tea. Finding ourselves in the Gironde at harvest time, I became aware that, although I have seen much information about what happens to grapes in the process of becoming wine, I had virtually no idea how grapes are grown or harvested. Inside the “tunnel” there are rubber beaters which slap the vine just above where the grapes are hanging. Only the grapes that are ripe will fall so it is crucial not to try and harvest until the right moment. Of course, every day that they remain on the vine after they are ripe is a risk of bad weather which can ruin a crop. The conveyor, in effect, places a table around the stem of the vine and moves the fallen bunches up to the bins above the wheels in the rear view. There are blowers to get rid of any leaves or twigs that may have come down with the grapes and the exit from the blowers can be seen behind the harvester. The vinyard owners don’t own the harvesters. They mostly belong to the local cooperative to whom the grapes will probably be sold. Getting access to the harvester on the day you want it is a matter of considerable concern to owners. Often, you will see the owner following the harvester on foot. He will be looking to see how many grapes are left on the vine after the harvester has passed by. Those are the unripe grapes and are lost income! The drive down to Salamanca from Miranda, Burgos and Valladolid did nothing to prepare us for Salamanca. Even the outskirts where we camped at Villamayor would lead you to suspect that Castilla y Leon province is a mixture of industry and vast plains of very basic agriculture. We saw a few small towns but virtually no villages at all. We had read the limited coverage in the Lonely Planet which did wax lyrical about the city centre but, of course, a couple of paragraphs can never really paint a realistic picture. The town center is magnificent, especially the Plaza Mayor. The cathedral is awesome showing the skill of the stonemason off at levels seldom seen elsewhere. It is a university town and so has a buzz that students bring. But the atmosphere is something else again! This place is the product of a backwoods part of Spain that has remained virtually untouched by the disasters of most major cities. Salamanca is not on the mass tourist trail. It has no massive claim to have been instrumental in the shaping of history. There hasn’t been the acid rain, air raids nor earthquakes that shape other places. Yet it has had the benefit of magnificent design and the wealth of the conquistadors to create the superb architecture that keeps you looking upwards as you walk. It feels like an attitude of mind. A different take on living. Here they respect the antiquities but they continue to use them without fear or risk of vandalism. As we walked into the Plaza Mayor, expecting to see some impressive architecture because the guide book promised us that, we were surprised to be met by a book fair filling the square with neat temporary shed shops selling their books. In the middle was a larger shed provided by the city library service. Here a brass band is giving a concert. They are not the best in the world but their performance had enthusiasm and flair – especially when it came to Carmen! The place is full of people bustling to and fro. In so many places, such venues are cleared for the tourists and, frankly, most struggle to make a living out of it. Here the tourists were not part of the equation. Life as it has always been makes use of the structure as it has always done. The cafes are alive and plentiful. Even on a Sunday, there are busy working shops selling cakes, bread and other delicacies. The tourists is merely a welcome, and welcomed, addition. They are not a contrivance nor even the object of life. Some tourist, of course, need to concentrate on the local delicacies like this one enjoying Churros dipped in hot chocolate – bought for her husband, actually! The walking is easy and the sights plentiful. But you soon notice that the majority of the crowd are residents going about their normal Sunday perambulations. Even the Plaza has residents. Real normal people live there not just pigeons. Having said that there are a couple of “residents” who surprised us by their presence – The Duke of Wellington (and us from Halifax!) and Franco!!! The whole experience seemed to come into focus as we realised that this was a city we would want to return to – just for the sake of feeling part of it. Haro claims to be the capital of the Rioja country. Certainly it has plenty of bordegas (wine makers) and vinotechs (wine sellers) but isn’t very large nor impressive. A typical town atop a hillock with impossibly narrow streets – which our GPS had us drive the complete rig through; fortunately at lunch time. It sits nearly at the foot of the mountains so, despite the river Ebro offering a limited river valley, there is little flat land and the vinyards claim any terrace they can find or have made. The vines are not the short tidy affairs that the French sport. These are much taller and more lush in foliage. They are also much scruffier to look at. The reason is, of course, that the concept of machine harvesting is viewed as a quick way to destroy ancient vines and to ruin a good wine. These vines are picked by hand. whilst others insist on the use of open wooden barrels which, they say, only take that weight of fruit that will ensure that the bottom berries don’t get damaged. before starting their maturation in yet more barrels. This time of American Oak. A bottle of the humblest Rioja could be had for €1.75 and wasn’t that bad! A crianza 2005 (a good year) was on sale in Simply for €2.50. Going up the scale, a Reserva which has 2 years in oak rather than the basic 1 for the Crianza would be between €3 and €9. The best, the Gran Reserva will have been in the cask for anything up to 4 years and then in the bottle for anything up to 12 years. This could be bought for as little as €20 but then there were plenty to sale at €70+ It was made very clear that the age did not always make a better wine. We were surprised to find that they make a series of white Riojas, although we didn’t like the ones we tasted. One of the more picturesque towns in the Northern Rioja area is Laguardia. This was a delight with its narrow streets and heavy doored hallways of the street. Behind this door would be a hallway, sometimes of considerable size, from which would be the access to two or more dwellings. The doors are often to be found open but the hallways are pitch black. However, with a flash on your camera it is possible to come home with some surprising pictures of places you have visited but never seen!!! Now how was that concept sold to the town burgers…? We enjoyed a very good lunch in Laguardia in a restaurant which we are fairly sure is owned by one of the local bodegas. The wine that came with the meal was of a far higher quality than any “house” wine we ever sampled and included free in a three course meal costing just €11 a head. The waiter even insisted in halving his tip saying it was too much! Having stayed at Labenne Ocean for 10 days, we finally managed to get out and have a look at Biarritz. Or where the houses lack archtectural merit. It is sometimes hard to spot reality…! Hint: All leftward facing elevations are blank walls! but, these days, it is more about surfing the Atlantic rollers. Judging by the unreasonable number of VW “surfer” vans, this is a prime location for the sport. This guy knows he is good and that requires a certain degree of respect – doesn’t it? A day we really enjoyed with brilliant weather to bring a smile to Liz’s face. Actually, this photo is here because it is one of the very, very few she seems to like!